NEXCOM fleet management system revamps public works with enhanced monitoring and operational efficiency to boost daily performance. A complete solution with ultraONE+ technology combines the VTC 1011 in-vehicle computer and the VMD 2003 vehicle mount display to feature strong computing power, 360-degree vision for safety of drivers and assets, installation flexibility, wireless communication and GPS tracking for monitoring, to achieve a greater level of monitoring and improved management for faster and reliable service. The fleet management system aims for safety by bringing wide-ranging external vision to drivers on the road and in-vehicle video feed to managers. Four analog cameras connected to the VMD 2003 vehicle mount display set in the cabin provide a clear vision of the truck’s surroundings to reduce blind spots and avoid accidents. 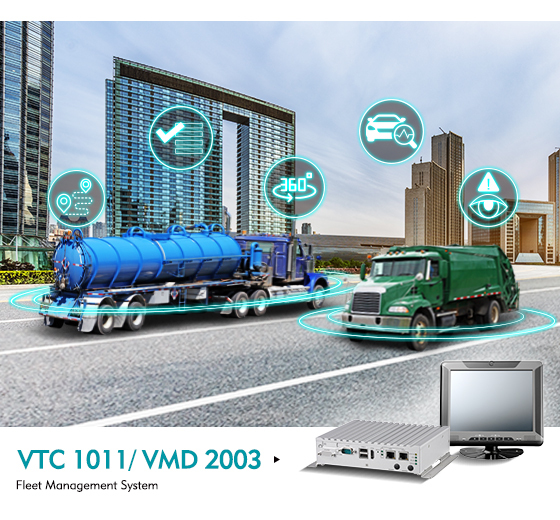 Two PoE ports in the VTC 1011 in-vehicle computer based on Intel Atom® Processor E3825 allow connecting IP cameras on the back of large vehicles to complete a 360-degree vision, especially suitable to assess any leakage in tank trucks or to facilitate maneuvering of waste management trucks around dense urban areas. Through in-cabin cameras, managers can identify poor driving habits and keep a video record guaranteeing adherence to safety policies while elevating drivers’ protection with drowsiness detection during long shifts. Featuring the new ultraONE+ technology, one cable transmits data and power between the VTC 1011 in-vehicle computer and the VMD 2003 vehicle mount display. System integrators can easily accomplish installation in different trucks used in public works setting the in-vehicle computer up to 10 meters away from the driver’s monitor without compromising video and sound transmission. Designed for operational efficiency, the fleet management system facilitates dispatching, keeps the units in optimal condition, and automates manual labor on the go. Equipped with GPS and wireless communications, the VTC 1011 allows dispatch centers to display the best routes for jobs in real time on the VMD 2003, minimizing deadhead time and mileage. Readings of engine speed, brake condition, or fuel consumption by using CAN bus and optional OBDII help fleet managers to identify irregularities and schedule preventive maintenance. At the same time, drivers can reap the benefits by replacing manual tasks in different applications, such as weighing the volume of waste collected when the fleet management system is connected to lift scales in recycling trucks, or providing instant proof of service through RFID readers.